Night of the Living Dead, George A. Romero's original zombie film that created the mold that almost every subsequent zombie story would follow for years to come. 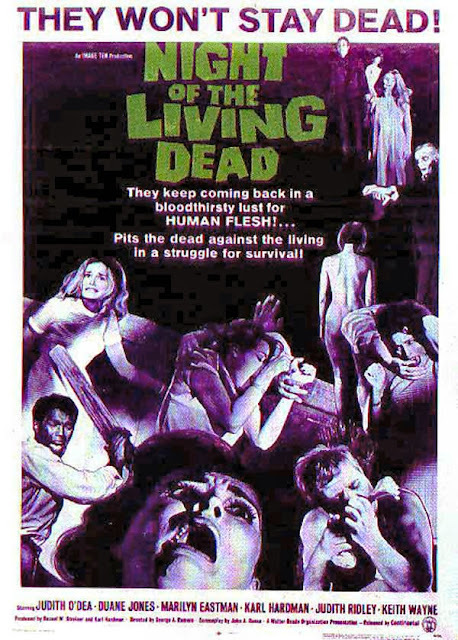 Before Night of the Living Dead, the zombie genre usually referred to mindless slaves under a spell of some kind (usually Voodoo), yet it is George A. Romero's classic suspense horror film that created the foundation on which the modern zombie genre is based on. As a fan of the Walking Dead and a few other zombie franchises, I wanted to see where the craze started, but does it live up to its undead legacy? 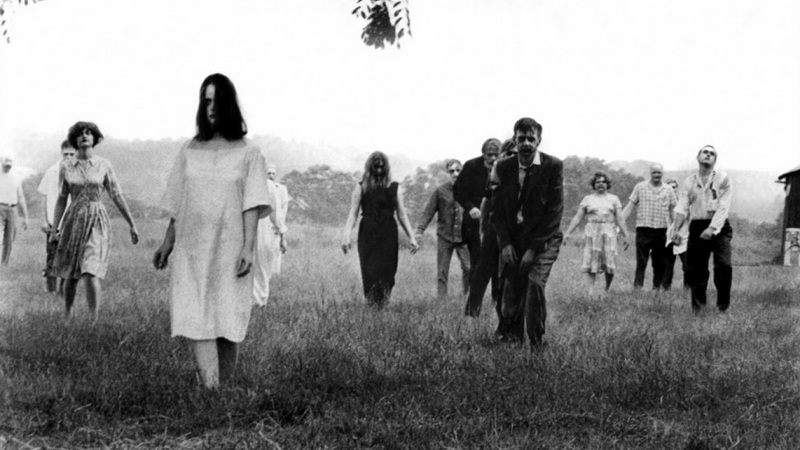 Plot: 7.2/10- Conceptually Night of the Living Dead is groundbreaking and revolutionary in almost every way. In execution however, the film suffers from its extremely low budget and B-movie aspects. On the positives, the way zombies in the film are portrayed (although the movie never refers to them as "zombies,” but rather ghouls) is almost exactly how they are today. Once you die, you come back within a few minutes to feast upon the flesh of the living, unless the brain is destroyed. Unfortunately, the thrills do not hold up today at all. While other classic horrors films such as Psycho and Alien are just as thrilling today as they were years ago, Night of the Living Dead rarely borders on suspenseful. Characterization: 3.5/10- The main character, Ben, is notable for being one of the first black main characters in a major motion picture, and he is easily the best aspect of the film. He is smart, calm, and has common sense in terms of dealing with the "ghouls," whereas the other characters are often dumb and selfish. The female lead, Barbra, is completely helpless, catatonic, and incredibly annoying. Sure, she does have a reason for freaking out, but does she have to be so annoying? The other characters are thinly defined and dumb for the majority of the film. Direction: 6.5/10- For the time, the zombie killing action was new, so I will give it a few points for that. Acting: 2.1/10- Outside of Duane Jones' performance as Ben, which is rather good, the rest of the cast is horrid! Granted, this is a B-movie, but does the acting have to be this unbearable!? Almost every single actor's delivery is either over-the-top or monotone and dull. Special effects: 7.8/10- For such a low budget, the zombie makeup and fleshing eating gore still holds fairly well today. It is certainly dated, but in the black and white, it looks alright. Soundtrack: 2.3/10- Literally taken from another B-movie, The Hideous Sun Demon, the score is about as generic and typical of the B-movie horror genre as it gets. Humor: N/A- Despite some acting that is so bad it makes you laugh, there is not any humor. Entertainment Value: 6.2/10- In spite the horrible acting, seeing where the zombie genre and its tropes began kept me intrigued for the majority of the film. Overall: 6.1/10- Despite virtually inventing a genre, George A. Romero's Night of the Living Dead is not a classic that stands the test of time, unless of course, you love corny B-movies. With that said, Night of the Living Dead does feature several strong elements amidst a bevy of horrible acting and cheesy dialogue. Closing comments: Fans of the zombie genre should watch Night of the Living Dead solely for the sake of viewing the original film that started it all. Others however, you should probably give this a pass in favor of superior zombie media like The Walking Dead or Romero's sequels. Click here to check out more of my movie reviews.